Oxfordshire's Eddie Pepperell will start the delayed final round of the 144th Open Championship still in contention, but has cursed his wayward driver that he is not even closer. The 24-year-old, now an established European Tour regular, shot a six-under-par 66 to move to eight under. He was jointly leading the tournament when he drove out of bounds to run up a double bogey six at 17. 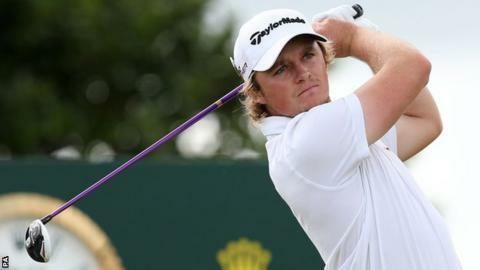 "It didn't come as a huge surprise," Pepperell told BBC Radio Oxfordshire. "It just came at the wrong time, that's all. Maybe you can put that sort of tee shot as down to why I've not won a tournament before. Pepperell had seven top 10 finishes in his rookie season on the European Tour in 2014 - three more this year have helped him rise to 85th in the Official World Golf Rankings. He made his major debut at Merion in the 2013 US Open and booked his place for St Andrews at the Irish Open in May as he won one of the three Open Qualifying Series places on offer. "To finish double bogey/par on this golf course is obviously disappointing. But, ultimately, I didn't hit the right shot off 17. And that's the problem with my swing, quite frankly. "I hit a similar tee shot off 6 and that's the reason why I didn't take driver off 12 - but you can't really not hit driver off 17. "I need to go off and work on my swing and make sure that, when I stand on that 17th tee tomorrow, I will feel confident of hitting the right shot." Eddie Pepperell has been paired with South African Charl Schwartzl, the 2011 Masters champion, for Monday's final round. They are scheduled to tee off at 13:20 BST. Admittedly, Pepperell suffered during the weather-triggered turmoil of the first three days, not completing his second round until late on Saturday evening. "I'm pretty pleased just to be here for the weekend the way I've played," he added. "I've not actually played that well, just putted well, and if I'd been offered a 66 and to be in this position on day three, I'd have taken it."